These delicious morsels not only taste great and travel well but also sustain travelers well. 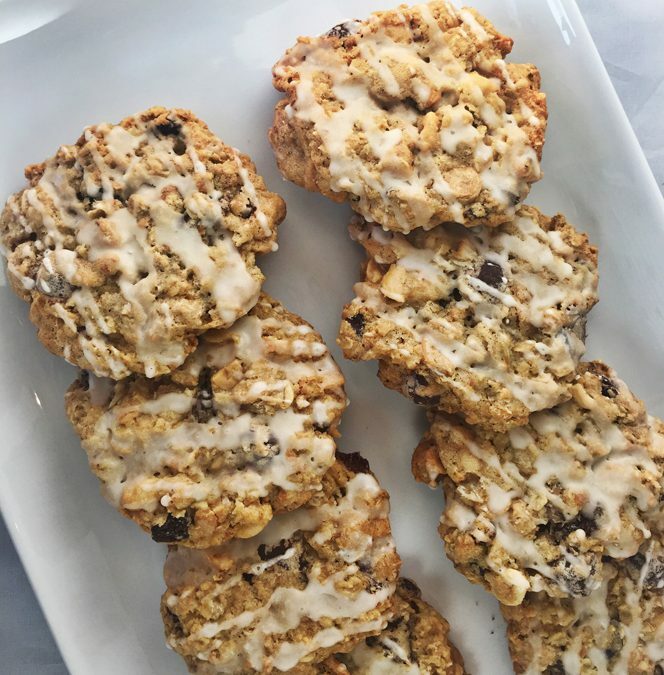 So if you are headed out for a spring day or down to the waterfront to celebrate the seasonal events, bring some Trail Mix Cookies packed full of nuts, dried fruit, oats, coconut, chocolate chips and peanut butter chips to keep your energy going. The brown butter drizzle icing isn’t necessary, but we just loved the extra flavor. In a small bowl combine the flour, salt, and oats. In the work bowl of a stand mixer, cream the butter and with the sugars until light and fluffy. Beat in the egg, the baking soda mixture and the vanilla. Add the flour/oat mixture and mix until just combined. Stir in the coconut, chocolate chips, peanut butter chips, peanuts, cashews, and raisins. Cover and chill the dough for one hour in the refrigerator. Preheat the oven to 375°F. Drop rounds of two tablespoons of the dough about two inches apart onto parchment lined baking sheets. Flatten the tops then bake the cookies in batches in the middle of the oven for 12 to 14 minutes, or until they are golden. Cool slightly on the baking sheets then transfer them with a metal spatula to cooling racks, and let them cool completely. In a small saucepan, melt the butter over medium heat until nut-brown in color, about 10 minutes. Remove pan from heat, and pour the melted butter into a bowl, leaving any dark brown sediment behind in the pan; discard the residue. Add the sugar, vanilla, and one tablespoon milk; whisk until smooth. If the icing is too thick to thin you can add the extra milk one tablespoon at a time whisking until you reach your desired consistency. Drizzle over the cookies and allow the icing to set before packing and storing in air-tight containers.